My wife, a school teacher has the pleasure of taking field trips with her class from time to time. This trip was special as it took her pupils (learners as they are now known in South Africa) away from Cape Town to a town on the otherside of the Hottentots Holland Mountains. To get there the bus had to travel along the N1 passing Paarl and through the Huguenot tunnel to get to the Breede River valley and the country town of Worcester. Worcester is known for a number of reasons, firstly it is the business centre of the Breede River Valley. It is also the centre of wine farming in the same valley and is the home of Kleinplasie a replica of a pioneer farm built at the local agricultural show grounds. 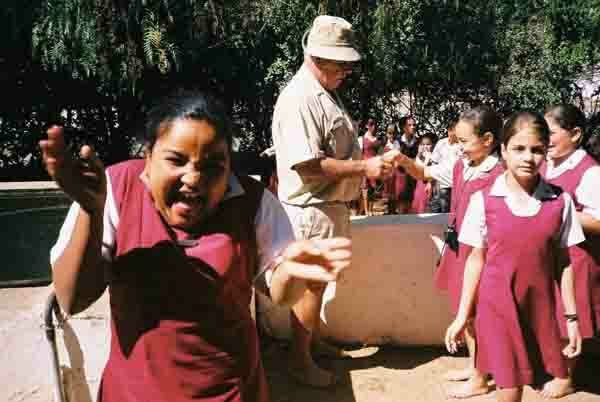 On this excursion the pupils were to visit Kleinplasie (Small farm). The farm consists of a typical farmhouse built in the style of the pioneer farmers who lived in the area in the 1800s. Other exhibits consist of a shepherds hut, an outside oven where bread is baked daily by the residents of the farm. Depending on the season when you visit the farm you may be able to see sheepshearing done in the old style using a sheep shear and not the modern clippers used today. It appears impossible but when a shearer uses his clippers he is able to shear a sheep in a couple of minutes and then spread the whole fleece onto a sorting table as if he has removed the skin of the sheep. Of course the merino sheep are dirty when sheared but once the wool has been removed they appear as skinny white sheep. Once the sheep has been sheared it is pushed into a pen with the sheared sheep and another is taken to the shearers to have its wool clipped off. The pupils are then taken to the sorting table and allowed to feel the clipped wool. It is very oily to the touch. On our trip, however, it was the time for harvesting of the grapes. Once the grapes have been picked they are brought into the cellars where they are pressed for their juice. On Kleinplasie however, they have a small cellar which is managed as they did it in the days of old. The learners getting ready for some fun Grapes are pressed in the time old way of stomping on them with your feet. This is where the pupils have some fun. 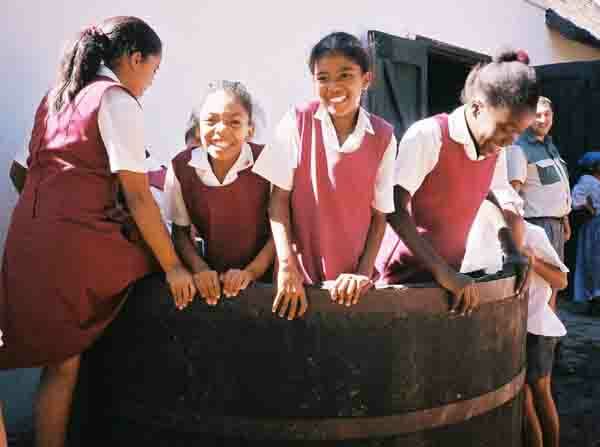 A couple of buckets of grapes are thrown into a keg and the children are allowed 4 or 5 at a time to climb into the keg and to press the grapes with their bare feet. 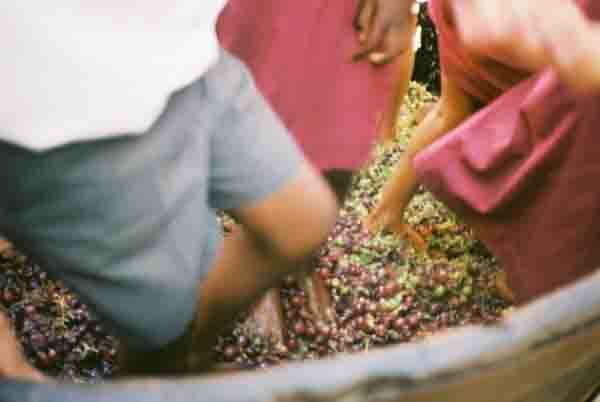 The tour guide runs a competition with the kids to see which group can get the most juice out of their grapes. The learners have great fun in the keg stomping on the grapes and for their trouble end up with about ten buckets of grape juice which is tapped from the vat when they are finished. From here the juice is placed into copper kettle where it is boiled and the steam collected and cooled in a similar process as was used by the whiskey makers in the prohibition times in the United States. The difference however is that the end product is just about pure alcohol and in South Africa is known as Wit Blits (White lightning). A couple of mouthfuls of it and you struggle for your breath. The learners are given a small taste of what they are making by being allowed to dip their finger in a glass and get a taste . Just look at the reaction in the photos I have included. Other products produced on the farm are boerejongens (farmerboys) and Kaapse Jongens (Cape Boys) which are grapes and apricots that have been soaked in Wit Blits. They are potent and only the seasoned farmer can eat one of them without gasping for breath. Some less potent products are also produced, such as soap, butter and bread and candles. These are sold in the farmstall. All the normal African curios are also available from the shops and there is a display of horse drawn carts from times past. The farm is well worth a visit for both adults and children. Let's see you there on your next visit to Worcester.